"Near miraculous." That's how one official from the Kentucky Transportation Cabinet described how everything came together to allow the Eggner's Ferry Bridge to be reopened to traffic in time for the summer boating season. When an off-course cargo ship obliterated one of the bridge's through truss spans on Jan. 26, the situation looked dire. 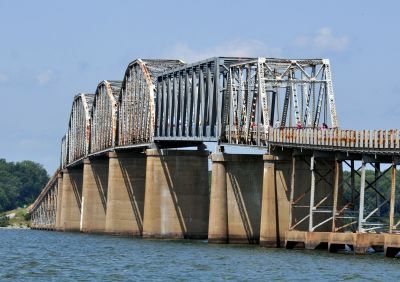 The Kentucky Lake region depends on tourism, and those tourists were likely to go someplace else during the summer to avoid the lengthy detours caused by the loss of the bridge. Despite the total destruction of a 322-ft span, the rest of the bridge, including the piers, remained intact. That's when KYTC decided to try to reopen the bridge with a temporary span. Hall Contracting, the same company that performed emergency repairs on the Sherman Minton Bridge at Louisville, was hired to fabricate and install a temporary span at Eggner's Ferry -- with a very strict deadline of Memorial Day. They delivered two-and-a-half days ahead of the deadline. Thanks to the early completion, KYTC decided to open the bridge to pedestrians during the morning of May 25 before allowing vehicular traffic. This was a repeat of the wildly successful "Bridge Day" at Owensboro, Kentucky, where a massive crowd came to see the newly refurbished Blue Bridge across the Ohio River. The Bridge Day at Eggner's Ferry, coming on a weekday with only several hours notice, wasn't able to attract the same overflowing crowd. But that didn't matter: a sizable crowd did arrive, and everybody who walked, bicycled, scooted, or golf-carted across the bridge had reason to be absolutely jubilant. The new truss span, a simple Warren design, isn't nearly as intricate as the historic Parker and Pratt trusses, and it tends to stick out like a sore thumb. But it's better than 322 feet of thin air. Or a UCEB. Immediately after the cargo ship struck the bridge, it seemed that the most likely outcome would be for the old bridge to be scrapped while construction would be expedited on a replacement bridge. That's the typical response in modern American society, after all: scrap first and ask questions later. If this option had been chosen, however, people around Kentucky Lake would expect to be making lengthy detours for two, three, or four more summer tourist seasons. Thankfully, circumstances made it feasible to repair instead of scrap; based on past experience, however, it's safe to say that not every highway department would have even entertained the idea of trying to repair the damaged bridge. In the aftermath of the I-35W Bridge collapse, truss bridges took a bum rap, with "experts" appearing out of the woodwork to claim that truss designs are inherently unsafe because they are "fracture critical." We've seen campaigns in many states and counties to eliminate all truss bridges from public roads, conveniently ignoring that other bridge designs have their own Achilles' heels. Nevertheless, it was a truss design that was chosen for the replacement span at Eggner's Ferry. The span was assembled off-site and then floated up Kentucky Lake by barge to the bridge site, where two cranes hoisted the superstructure into place. It was an economical design that could be rapidly put together and installed. The more things change, the more they stay the same: these are the same benefits that bridge companies have touted for truss designs for the last century-and-a-half. In a recent forum comment, a letter from an Ohio legislative aide was posted arguing that relocating truss bridges was an "unheard practice in today's technological age." What a load of expletive. 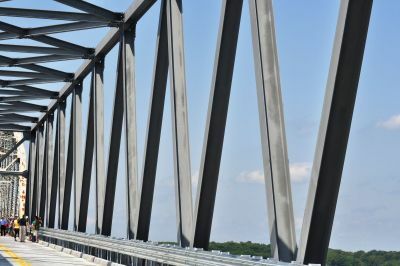 Even with all of these technological advances at their disposal, the contractor for rebuilding Eggner's Ferry Bridge still relied on the tried-and-true practice of moving a prefabricated truss into place. Meanwhile, just downstream at Kentucky Dam, a new railroad truss bridge was built in 2009 using the same method: floating the truss by boat and then lifting it into place. And let's not forget about the amazing development in Illinois last year where a UCEB was replaced by a historic through truss relocated from another location. Trusses were meant to be moved, either for initial construction or for later reuse elsewhere. This was a selling point historically, and is still true today... except perhaps in Ohio. It was fun to see all of the camera-toting people studying every square inch of the bridge while it was open to pedestrians. Letting visitors get a sneak preview of the bridge repairs was a nice touch, something that other highway departments should embrace. 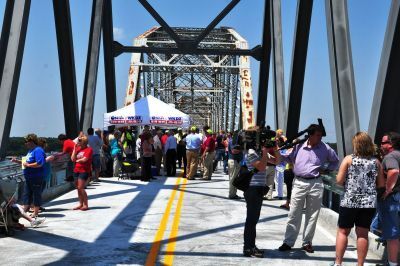 With last year's Bridge Day at Owensboro and now the Bridge Party at Eggners Ferry, it seems Kentucky has stumbled across an offbeat, but successful, kind of tourist attraction. 5. Throw enough money at a engineering problem, and anything is possible. Well, I think we all knew this. It's just too bad there aren't a whole lot of opportunities for politicians to throw money at repairing historic bridges. The replacement span is built with bolted steel girders. This is a really incredible story! I guess I missed this, but did they build the temporary truss out of concrete, or metal? The pictures looked like they were all concrete, but it seems very difficult to do it from concrete in such a short time!